There are fishing trips and then there are fishing adventures. A fishing trip may be nothing more than catching panfish on live bait near home. A fishing adventure is something else indeed. It is a happening, a wonderful outdoor experience, and one filled with angling excitement that will keep a hot fire burning inside every person aboard the boat. Capt. Jack Duffy is the kind of licensed charterboat skipper who has a zest for life, a burning desire to make every fishing trip memorable and the stuff of which fishing dreams and legends are made. He is outgoing, wildly in love with fishing Lake Michigan for trophy Chinook and coho salmon, and the creamy-spotted lake trout that makes anglers enjoy catching fish. He also catches brown trout and high-jumping steelhead. One thing about Duffy: A trip from his home port of Leland, is an unforgettable adventure. He works very hard to get clients into fish. He’s a one-of-a-kind, genuinely unforgettable fishing expert. His 27-foot Tiara is well-known as the “Whitecap” fishing out of Leland, Michigan. It is designed for comfort and safety with plenty of room in the stern to do battle with big fish. Whitecap has the latest electronic equipment will help anglers catch fish. 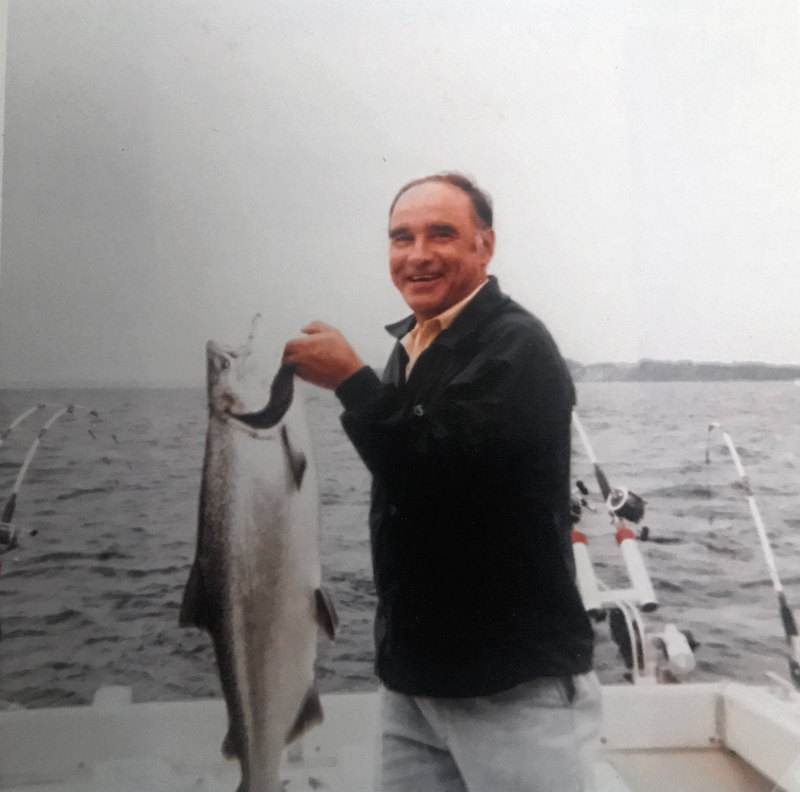 Leland has been the Lake Michigan port for big Chinook salmon since the early 1970s, and nearby North and South Manitou islands helps funnel these hard-fighting game fish into his fishing area. It’s here, off the Manitou Islands during the summer months where the possibility of limit catches attract destination-oriented and walk-on anglers. Fishing with Capt. Jack Duffy on the Whitecap is an adventure that anglers will want to book from one year to the next. His boat, moored in historic Fish Town, puts anglers close to the fishing action within minutes of leaving port. Fishing with this master angler, featured in “Outdoor Life” and “Sports Afield”, is one of life’s great experiences. 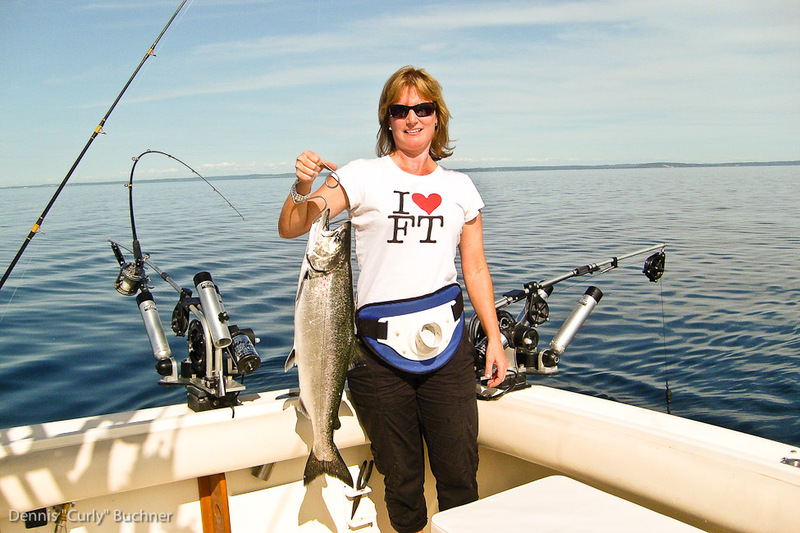 Call 231-883-7530 to book your fishing adventure with Capt Jack Duffy. Tomorrow is forecast to be nearly the same temperature as today. Partly cloudy. Lows overnight in the upper 20s. Some clouds. Low 27F. Winds NNW at 10 to 15 mph. Intervals of clouds and sunshine. High 39F. Winds WNW at 5 to 10 mph. Overcast. Low around 30F. Winds SSW at 5 to 10 mph. Periods of rain. Winds increasing late. Snow may mix in. High 39F. Winds SSW at 25 to 35 mph. Chance of rain 100%. Rainfall near a quarter of an inch. Cloudy and windy. A few flurries or snow showers possible. Low 21F. Winds WNW at 25 to 35 mph.